Yes I know, the Nyan-Cat smiley on Google Talk and some comments are hillarious but quite a few days known widely. But here is a short list of special smiley to try out. 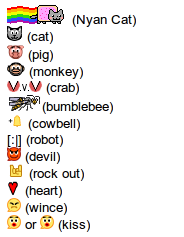 It transforms into graphical emoticons and even animations when sent to Google Talk e.g.